A weekly podcast telling the story of the Korean War from 1950 to 1953. In 1946 the Philippines becomes independent but there is much corruption and Police oppression. A rural revolt begins, the Communist do not support it until May 1948. When the Korean War starts the United States Government increases military aid to the Government of the Philippines but the Americans insist that Ramon Magsaysay becomes Minster of Defence to led the fight back against the now communist supported revolt. A biography of Ramon Magsaysay who would become President of the Philippines. In 1948 a Communist revolt in Burma begins which would last for more than 40 years.. . . There is growing distrust between Indonesian President Sukarno and the Communist towards the Army Generals. After a failed left wing coup in October 1965, the Generals turn on the Communists killing at least half a million of them. In 1966 the General began to oust President Sukarno from power. A biography of General Suharto who would rule Indonesian for over thirty years and would ally himself with the west.. . .
Indonesian troops launch raids against the Malaya mainland. In North Borneo there are several firefights between Indonesian and Commonwealth troops. The war goes badly for the Indonesians, it peters out in 1966 after dramatic events within Indonesia in October 1965. A biography of the new commander of Commonwealth forces in North Borneo, Major General George Lea.. . . The left wing revolt in North Borneo in 1962 is defeated by the British Army. Indonesian President Sukarno sends Indonesian regular troops to fight in North Borneo in 1963. The battle of Long Jawai. British Government hands over most of North Borneo to Malaysia but promises to maintain troops there. A biography of General Walker the commander of Commonwealth in North Borneo during the first part of the Indonesian Confrontation.. . . The Indonesian War of Independence against the Dutch. A biography of Indonesian President Sukarno, he slide into dictatorship. Sukarno growing links with Communism at home and aboard. Sukarno opposes plans by the British Government to hand over North Borneo to Malaysia. The geography of North Borneo.. . .
Malaysia becomes an independent state. A biography of Henry Lee a senior member of the Government of Malaysia. The emergency comes to an end in 1960, the Communist guerrillas having been defeated by the Commonwealth forces. The reasons why the victory in Malaya could not be copied in Vietnam. A second Communist insurgence begins in 1968.. . . The British Army and Malay Police grind down the Communist guerrillas, increasing amounts of Malaya are declared free of Communist terrorism. The Malay Communist Party seek a peace deal with the newly elected Government of Malaysia but talks break down and the war carries on. The politics of Malaya and Singapore. A biography of Tunku the first prime minister of Malaysia.. . .
High Commissioner Gerald Templer creates so called 'white areas' free of Communist terrorism where the emergency regulations can be ended. The British Army push the Communists back into the jungle highlands. The level of Communist activity declines. Templer leaves Malaya and is replaced as director of operations by Lieutenant General Bourne, a biography of the man.. . .
Gerald Templer becomes the new High Commission and Director of Operations in Malaya. He dismisses officials who have been block to good cooperation between the Army and civil administration. The British Intelligence service greatly improves, cash rewards are given for information. British Army and Malay Police begin to defeat the Communists. A biography of Gerald Templer.. . . The life and death of Sir Henry Gurney, who is murdered in a Communist ambush. The rising level of Communist terrorism in Malaya. The disappointing results for the British military in 1951. A new British Government led by Winston Churchill demands changes in the way the war is fought.. . .
Malaysia becomes an independence state in 1957. A biography of Henry Lee a leading member of the new Malaysian Government. The Communist guerrillas are finally defeated by the Commonwealth forces and the emergency ends in 1960. Why the reason for the victory in Malaya did not apply in Vietnam. The second Communist insurgency which began in 1968.. . . In 1957 Malaysia becomes an independent state, A biography of Henry Lee a senior member of the new Malaysian Government. By 1960 the emergency is ended, the Communist guerrillas having been beaten by the Commonwealth forces. The reasons why the victory in Malaya could not be repeated in Vietnam. A second Communist insurgency begin in 1968 but that too would be beaten a twenty year campaign.. . . The military campaign in 1950 in Malaya. A look at the Communist tactics against British Army patrols and what life was like in a Communist camp. Sir Harold Briggs arrives in Britain to become the Director of Operations he creates a plan to improve relation between the Army, the Police and the civil service. The Chinese squatter population are to be forced into so called ‘new villages’ to stop the flow of suppliers to the Communist guerrillas. A biography of Sir Harold Briggs.. . . The war in Malaya between the British Army and the Communists in 1949. The growing level of Communist terrorist activity. The British Colonial Government recruits ethnic Malays to fight the mainly ethnic Chinese Communist forces. The expansion of the Malay Police force. A biography of Chin Peng the leader of the Malayan Communist Party.. . . The war in Malaya between the British Army and the Communists begins in June 1948 with the killing of three British rubber planters. The British killed the military commander of the Communist forces. The Communist establish areas of control within the jungle highland with the support of the ethnic Chinese squatter population. A Biography of the British High Commission from 1946 to 1948 Sir Edward Gent.. . . The Communist Malay People's Anti Japanese Army fight a guerrilla war against the Japanese occupation and are armed by the British. In 1945 British troops reoccupy Malaya but their policy of the issue of citizenship manages to alienate each of the ethnic groups in Malaya. A biography of Lai Teck Communist leader during the Second World War.. . .
A short history of the growing British economic and political power in Malaya during the 18th, 19th and early 20th Century. The large scale immigration of Chinese and Indians to work in British owned tin mines and rubber plantations. The defeat of the British Army by the Japanese Empire in 1942. The Japanese occupation of Malaya between 1942 and 1945 with its brutal repression of the ethnic Chinese population. A biography of Lieutenant General Arthur Percival, the commander of the British Army in Malaya in 1941.. . .
At the Geneva Peace conference in 1954, an agreement is reached to end the war in Indochina. Vietnam would be divided, the Communist gaining control of the north. The French Army leave Hanoi and the Red River Delta. Diem becomes the leader of South Vietnam from 1954 until is overthrow and death in 1963, a biography of him.. . .
On May 1st General Giap orders the Viet Minh army to attack the remaining French defensive positions, most of the attacks are successful. The French are greatly outnumbered and even the wounded are pressed into service. French resistance ends on May 7th. General Ely becomes the French Army commander in Indochina a biography of him. The French Government falls and the new premier promised to end the war in Indochina within 30 days.. . . The Viet Minh took some weeks to restock their supply of Artillery and Mortar shells and received new recruits into their infantry to replace the losses they had suffered. A biography of Colonel An who would become the new commander of the Viet Minh 174th Regiment. There was a growing problem of French troops deserting within the Dien Bien Phu garrison. However the French retake the hill position of Elaine One.. . . Lieutenant Colonel Langlais assumes effective control of the French garrison at Dien Bien Phu, a biography of him. The Viet Minh attack the eastern defences of the French base, most of which are successful but some French defensive positions do fight the Viet Minh off. The Isabelle position, south of the main base is cut off by the Viet Minh. However the Viet Minh do suffer heavy losses during this battles.. . .
On March 1954, the Viet Minh launched an artillery barrage upon the French garrison. In the evening Viet Minh infantry attacked the Beatrice defensive position, capturing it an destroying a Foreign Legion battalion. On March 14th the Viet Minh attack and latter captured the Gabrielle position, destroying an Algerian battalion. A biography of Colonel Le Tan, the commander of the Viet minh 312th Division.. . . The French Army build a defensive positions around Dien Bien Phu, with blockhouse protected by barbed wire and trenches. The French Army raids into the surrounding countryside become more difficult as the Viet Minh move four infantry divisions and a heavy weapons division into the area. The French Army launch and offensive in Central Vietnam. A biography of General Cogny, the French Army commander in North Vietnam.. . .
On November 20th 1953, the French Army drop parachute troops into the area of Dien Bien Phu. The French win control of the area after a battle with local Viet Minh forces. An airstrip is built and sup[plies flown in. The French garrison commander is Colonel De Castries, a biography of him. The Viet Minh pour troops into the hills surrounding the French base. General Giap orders two invasions into Laos.. . .
Opposition to the war in France grows. General Henri Navarre is appointed as the new commander of the French Army in Indochina. He plans to expand both French forces and those of his Vietnamese allies. The French Army launch an operation along Highway Four near the border with China and another operation to defeat the Viet Minh 320th Division. General Navarre plans for a French military operation to occupy a valley in North Vietnam which contains Dien Bien Phu. A biography of General Navarre.. . .
General Salan becomes the new commander of the French Army in Indochina, a biography of him. The French Army sends men to train the hill tribesmen to fight the Viet Minh. The French Army launches an offensive to the North West of Hanoi. General Giap orders his army to invade Laos but along the way suffers a repulse at Na Sam.. . . The commander of the French Army in Indochina, General De Lattre improves relations with the Americans. The French Army captures the town of Hoa Binh but the Viet Minh fight to cut the supply routes to the town and the French Army is forced to retreat. The death of General De Lattre and General Chanson commander of the French Army in South Vietnam, his biography.. . .
General Giap decides to defeat the French Army in a open battle within the Red River Delta. The appointment of the French Army commander in Indochina General De Lattre, a biography of him. He orders a fortified line around Hanoi and the Red River Delta to be built. The French Army defeat the Viet Minh in three battle in January, March and May 1951.. . . There is a lack of proper coordination between the French Army in Indochina and the American Military Mission in Saigon. An account a guerrilla camp in outside of Saigon. The French Army is better by the Viet Minh along Highway Four near to the border with China. The French Army retreat to Hanoi and the Red River Delta. A biography of the commander of the French Army in Indochina General Carpentier.. . .
As a result of the Communists winning the Chinese Civil War, the border is opened up for the supply of heavy weapons to the Viet Minh. The Viet Minh also set training schools in southern China for to give their troops advanced training. The United States Government decided to supply the French Army in Indochina with the weapons and equipment they need. A biography the American Secretary of State Dean Acheson.. . . The French Army can not seem to win the war and it is costing the French Nation heavily in both blood and money. At last the French Government agrees to grant a nominal form of independence to a Government in Vietnam under the leadership of the former emperor. There is heavy fighting along highway four close to the border with China. The different types of Viet Minh soldiers, the regulars, the regionals and the village militia. A biography of a Viet Minh battalion commander.. . .
As the war shows no sign of ending, there outrages continued by both sides in France the war became known as the dirty war. There is heavy fighting along Highway Four near to the border with China. A biography of General Giap the commander of the Viet Minh army.. . . The Viet Minh conduct a guerrilla war against the French but avoid all out battle. The different types of troops within the French Army, Colonial, Foreign Legion, North African and Indochinese. The reason why the French Government refused to reach a peace deal with the Democratic Republic of Vietnam. A biography of the new French Governor Emily Bollerat. The two major French Army offensive in North Vietnams in the last few months of the war.. . . The French military stage their coup to regain control of North Vietnam in November 1946. In Haiphong the French Army with naval support seize the port. In December the French Army seize control of Hanoi defending the Viet Minh in a battle for the City. The Viet Minh withdrew to countryside and evade the French Army. The position of the International Communist Movement towards Vietnam. A Biography of the leader of the French Communist Party and leading critic of the French role in the war, Maurice Thorez.. . . The French Army commander General Leclerc reaches an uneasy peace deal with Ho Chi Minh, which will allow the Democratic Republic of Vietnam to run the internal affairs of North Vietnam while the French Army are to be allowed to return to their bases in the North. General Leclerc is replaced by General Valluy who with the French Colonial Governor plan for a military take over of North Vietnam. A biography of General Vulley. The geography of Vietnam and why it was so ideal for guerrilla warfare.. . . In August 1945, the Japanese Empire surrenders. In Vietnam, nationalist groups seize the cities. In Hanoi Ho Chi Minh declares independence of the Democratic Republic of Vietnam. In the North the Chinese Nationalist Army accept the surrender of the Japanese Army but allow Ho Chi Minh to run domestic affairs. In the South the British and the French Armies return the country to French Colonial control. Attempts by the Viet Minh to stop this ends in heavy defeats. A short biography of Bao Dai, the last emperor of Vietnam.. . . The failure to win the war leads to outrages by both sides. In France the war becomes known as the Dirty War. The failure of the French military policy of building outposts. The fighting along Highway Four close to the border with China. The failure of the French to win popular support for their Vietnamese Government but they do have some success in winning over non Communist militia groups. A biography of General Giap, the commander of the Viet Minh Army.. . . The French occupation of Indochina from 1862 to 1945. Indochina becomes a colony to be used for the benefit of the French business. The French Colonial Authorities try to crush Vietnamese Nationalism. A Biography of Ho Chi Minh the leader of the Vietnamese Communists. The Japanese Army invade Indochina in 1940 but the French Colonial Authorities continue to work with the Japanese until March 1945.. . . The reason for this special edition is two fold, firstly many people have emailed me about my opinion about the present tension in Korea over the North Korean Atomic Bomb and missile programmes. A secondly to announce further future episodes which would place the Korean War in its historical context of the time, which explain why such was the fear of a Communist take over of Asia, that explain why American committed itself to a three year long war in Korea. The next series of such episodes is on the First Indochina War fought between a Communist Army and a western power, France which lasted from 1945 to 1954.. . . 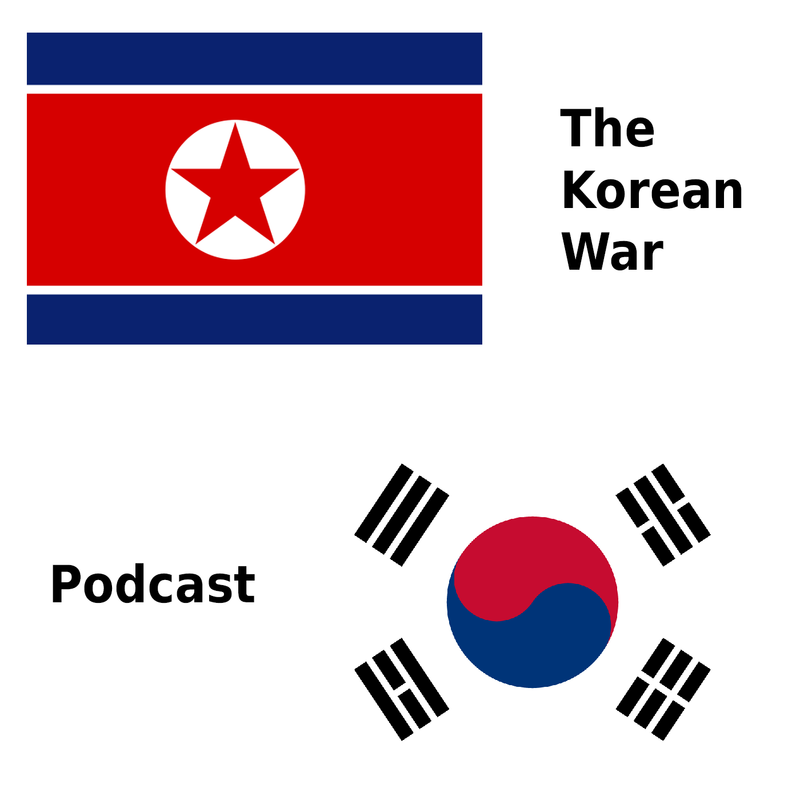 In the final episode of this podcast series, I tell of some of the major incidents along the Demilitarised Zone and off the seas of Korea that have occurred since the end of the Korean War.. . . In this the second of three special episode to wrap up on the Korean War, I shall attempt to answer question sent to me by listeners.. . . In the first of three special episode, I tell the stories of some of the winners of the congressional medal of honour and the Victoria Cross won during the Korean War.. . .
At last the final day of the Korean War arrives. An armistice is signed at Panmunjon between Nam Il and Harrison. However there are still artillery and air attacks even on this last day. Both sides withdraw two kilometres and there is an exchange of prisoners of war between the two sides at Panmunjon. A review of the performance of General Maxwell Taylor, Mark Clarke and Peng.. . . The peace talks at Panmunjon make slow but steady progress to reaching a cease fire deal to end the Korean War. However there still time for the Chinese Army to successfully launch their summer offensive against the South Korean Army. Once the offensive is over an arrangement is finally reached. a biography of William Harrision leader of the United Nations delegation at the peace talks.. . .
Fighting along the front line in June 1953. The South Korean President Rhee orders that 25,000 North Korean Prisoners of War who do not wish to return to North Korea are to be helped to escape. A biography of the South Korean Minster of Nation Security who planed the escape. The fury of the American forces Rhee to agree an armistice.. . .
Fighting along the front line in May 1953 but the Korean War was not ended on the battlefield but at the peace talks at Panmunjon. The peace began again and make slow but steady progress. A biography of Nam Il the head of the North Korean delegation. The South Korean President Rhee bitterly opposes any suggestion of a peace deal.. . . The Chinese Army overruns Old Baldy and American attempts to recapture it fails. General Maxwell Taylor the commander of the Eighth Army decides to halt any further counter attacks. The battle for Pork Chop Hill begins, the Chinese Army but this time in heavy fighting the American Army retains control of the hill. Serious talks to begin between Communist and the United Nations about ending the Korean War. A biography of John Foster Dulles the American Secretary of State.. . .
Stalin's health is poor due to old age but he blames the Doctors, so begins the Doctors Plot and the arrest of hundreds of doctors. In March 1953, after a heavy drinking Stalin suffers a stroke and dies a few days latter. The new Soviet leadership decide they want an end to the Korean War. There is a power struggle within the new Soviet leadership. The Communist and United Nations exchange sick and wounded prisoners of war. A biography of Beira the murderous head of the Soviet secret police.. . . The fighting along the front line in January and February 1953. The failure of the American attack upon Spud Hill. The life of an American infantryman in the Korean War. Van Fleet is replaced as the commander of the Eighth Army by Maxwell Taylor. A review of the performance of Van Fleet and the biography of Maxwell Taylor.. . .
Fighting along the front line during November and December 1952. The strength of the defences of both sides. The state of Communist China and North Korea during the Korean War. Mao launches a major purge within China. Kim Il Sung the North Korean leaders wants a truce but Stalin refuses. A biography of Zhou Enlai, the Chinese Foreign Minster.. . .
As peace talks brake down in September 1952, the Chinese and North Korean Armies launch a number of attacks along the front line. General Van Fleet launches his own offensive Operation Showdown against the Chinese position at Triangle Hill and Sniper Ridge. The story of Ralph Pomeroy who won the Medal of Honour at Triangle Hill.. . .
Hill fighting along the front continues in July and August 1952. An American Steel strike affects the production of arms and equipment. Eisenhower wins the election to become President in November 1952. He goes to Korea to see the Generals and the front line. A biography of Dwight Eisenhower.. . . The American seize two hills from the Chinese, Old Baldy and Pork Chop Hill. The Chinese Army launch fierce counter attacks to regain Old Baldy but fail to retake the hill. The medical services provided to help the wounded. The Mobile Army Surgical Hospitals. A biography of General Mark Clarke the new commander of American forces in the Far East.. . . The lull in fighting along the front line continues but the war carries on the sky and the sea. The American Air Force concentrates its bombing missions on destroying the Communist supply lines but with only limited success. Later the Air Force attack certain targets such as Power plants, Dams and Rice Warehouses with more success. The United Nations Naval forces continue the blockage of North Korea. A biography of Admiral Briscoe, the commander of American Naval forces.. . . There is a lull in the fighting along the front line. The need to retrain the South Korean Army. Living standards among ordinary South Korean fall sharply during the war. The repressive nature of the Rhee regime. President Rhee tries to block attempts to end the war in Korea. A biography of Tiger Kim a brutal South Korean Police chief.. . . The fighting along the front decreases as a result of the winter weather. The failure of the American Air force campaign to halt supplies reaching the Communist armies. The plight of United Nations prisoners of war held by the Communist, their high death rate and poor conditions. A biography of Otto Weyland, the commander of the American Air Force in the Far East.. . . The battle of the Bloody Angle within the Iron triangle. The Americans win the battle for Heartbreak Ridge but at a cost. The 1st and 9th undertake a slight advance forward. Air battles in North West Korea. The Columbian Battalion during the Korean War. The plight of Communist prisoners of war held by the United States. A biography of Major General Byers the commander of the 10th Corp.. . .
General Ridgeway, the commander of American forces in the Far East offer peace talks to the Communist. There is a lull in the fighting but the battle for the Punchbowl begins. Peace talks start but they soon run into trouble and become bogged down. Stalin wants the Korean War to continue. A biography of Stalin the Soviet leader.. . . Lieutenant General Van Fleet the commander of the Eighth Army increase the number of artillery shells for the Army. The poor performance of South Korean troops. The Communist armies retreat as the Eighth Army advances. The Soviet Union proposes peace talks.. . . The battle of the Kapyong Valley. The Chinese Fifth Offensive comes to an end, ground is gained but the cost is very heavy. Chinese Infantry tactics. The Chinese launch their sixth offensive in Central and Eastern Korea again ground is won but the casualties are heavy. A biography of Goa Gang in charge of the Chinese Army logistics.. . . The Chinese Army launch their fifth offensive. The British Gloucestershire Regiment is destroyed but they inflict heavy losses upon the Chinese at the Battle of the Imjin River. Elsewhere the Chinese Army make progress but at the cost of heavy losses. The Belgian Army during the Korean War. A biography of Deng Hua, the commander of the Chinese 13th Army.. . .
General Douglas Mac Arthur launches several public attacks upon the Truman administration. Truman decided to sack Mac Arthur. Mac Arthur receives huge public support and successfully address Congress but does not impress in front of a congressional committee. A biography of Omar Bradley the Chairman of the Chief Joint of Staff. . .
General Ridgeway, the commander of the Eighth Army begins Operation Killer and Ripper to thrown back the Communist armies. The Eighth Army retakes Seoul the capital of South Korea. The Canadian Armed Forces Forces sent to Korea. General Mac Arthur sabotages a proposed American peace offer. A biography of Major General Hoge the new commander of the 9th Corp.. . . The Eighth Army pushes forward and retake the port of Inchon. The Chinese Army launches its fourth offensive in Central Korea, they defeat three South Korean Divisions. However an attack upon the American 23rd Regiment is a costly failure. A biography of Colonel Freeman the commander of the American 23rd Regiment. The New Zealand Army and Navy in the Korean War.. . . The Chinese Army attacks the Seoul bridgehead and General Ridgeway decides to withdraw from Seoul. The Communist retake the City of Seoul. The 1st and 9th Corp withdrew well to the south and destroy the port of Inchon. The United Nations win the second battle of Wonju and retake the town. The Second North Korean Corp is defeated within the Taeback Mountains. A biography of Major General Moore the new commander of the 9th Corp.. . .
Pressure from Mao forces General Peng to launch the Chinese third offensive before he wanted too. However the Chinese and North Koreans brake though the South Korean Divisions. General Ridgeway withdraws the 1st and 9th Corp to the Seoul bridgehead. The First battle of Wonju. A biography of Major General Mac Clure the commander of the American 2nd Division.. . . The American Army undertakes its longest retreat. The morale of the Eighth Army falls badly. The death of General Walker and an assignment of his performance as Eighth Army Commander. The murder of prisoners by the South Korean Government. The French Army commitment to the Korean War. A biography of General Matt Ridgeway, the new commander of the Eighth Army.. . .
Oliver Smith the commander of the 1st American Marine Division plans for a likely Chinese attack. Two battalions from the American 7th Infantry are defeated but the Marines hold firm and fight their way back to the south. The Chinese suffer many deaths because of the extreme cold. A biography of General Song the commander of the Chinese 9th Army.. . . The Eighth Army launch their own attack towards the north but is caught off balance when the next day the Chinese Army launch their own second offensive. The Chinese pin down most of the American troops while they crash into the right flank of the Eighth Army. Many South Korean troops flee in panic, the American 2nd Division suffer heavy losses. A biography of Major General Keiser.. . . The failure to realise the threat of the Chinese Army in Korea at General Mac Arthur's Headquarters in Tokyo. General Mac Arthur orders the United Nations forces to advance towards the Chinese border. The advance of the Tenth Corp and the South Korean 1st Division into North East Korea, leaving their left flank exposed. The Chinese prepare for their second offensive. A biography of Charles Willoughby, General Mac Arthur's chief of intelligence.. . . The Chinese First offensive continues and the American 1st Cavalry Division is defeated at Unsan, the offensive ends due to lack of supplies. The bridges over the Yalu River are bombed. North Korean fighters attack the United Nations rear supply lines. A biography of General Peng the commander of the Chinese Army in Korea and his terrible fate.. . .
General Mac Arthur and President Harry Truman meet at Wake Island to discuss the war. Mac Arthur assures the president that there will be no Chinese offensive in Korea. The Chinese in fact do launch their first offensive, attacking the South Korean 1st Division around the town of Unsan. The Chinese defeat the South Korean Second Corp which is routed. A biography of Xi Fang the chief of staff of the Chinese Army in Korea.. . .
As the North Korean Army faces defeat, Stalin refuses to offer Soviet military forces to defend North Korea but suggest that the North Korean Government asks China for military support. China warns the United States not to cross into North Korea. Mao agrees to use of Chinese troops in Korea. China builds up its army in Manchuria, then cross into North Korea. A biography of Mao the Chinese Communist ruler.. . .
General Mac Arthur orders the United Nation forces to cross the 38th Parallel and invade North Korea. The First Corp capture Pyongyang, the capital of North Korea. The South Korean First Corp capture the port of Wonsan before the Marines can land there. An parachute landing north of Pyongyang fails to trap the North Korean Army. A trainload of murdered American prisoners of war is discover. A biography of George Marshall, the American Secretary of Defence.. . .
On September 16th the Eighth Army begins its breakout from the Pusan perimeter. North Korean resistance begins to weaken. The American retake the City of Taejon finding evidence of North Korean killings of civilians and prisoners of war. The Eighth Army links up the Tenth Corp. A biography of Lieutenant General Milburn, the commander of the First Corp.. . .
American Marine capture the Kimpo peninsular and then cross the Han river. A three day battle between at the western edge of Seoul between American Marines and the North Korean Army. The Tenth Corp capture Seoul, General Mac Arthur visits the City. The Tenth Corp secure the area around Seoul.. . . The Naval and Air Force attacks on Inchon and Moon Tip Island. The capture of Moon Tip Island by American Marines in the morning. The wait for the high tide to return. The Marines land in Inchon. South Korean Marines mop up remaining North Korean resistance. A biography of Major General Oliver Smith, the commander of the 1st Marine Division.. . . The planning of the Inchon landing. The difficult nature of the tidal reach at Inchon for the naval planning. The American and South Korean forces to landed. The North Korean defences. The covert Naval intelligence mission. A biography of Admiral Stubble the Navy commander for the landings.. . . The South Koreans with American help defend the northern flank against the North Korean September offensive. The effect of the Korean War upon Japan. General Mac Arthur's Headquarters in Tokyo. A biography of Major General Coulter the deputy commander of the Eighth Army.. . .
Three North Korean Divisions attack towards the City of Taegu but the American 1st Cavalry Division hold them back from the City. The state of alarm within the headquarters of the Eighth Army. A biography of Earl Warren a sergeant who gave his life to save his comrades.. . .
As part of the North Korean September offensive the 6th and 7th Divisions are repulsed by the American 25th Division. Four North Korean Divisions attack the American 2nd Division and the North Koreans retake Cloverleaf Hill. A biography of General Kim the commander of the North Korean First Corp.. . . The Battle of the Bowling Alley where North Korean tank and infantry attack are been off by the Americans. Further American reinforcements, The placement of Koreans within American units. The North Korean plans for their September offensive. A biography of the commander of the North Korean Army, Kim Chaek.. . . The attack of the North Korean 6th Division against the American 25th Division in late August 1950, including the fight for Battle Mountain. The British Armed Forces during the Korean War. A biography of Ernest Bevin, the British Foreign Secretary.. . . The attach of the North Korean Second Corp overwhelms the South Korean Army. The reason for the weakness of the South Korean Army. The creation of war industries within the Pusan perimeter. The care of refugees. A biography of Yu Jae Huung, the commander of the South Korean Second Corp.. . . The North Korean 3rd and 10th Division cross the Naktong River and attack the American 1st Cavalry Division. The Battle of Triangulation Hill. American Air Force operations during the Battle for the Pusan Perimeter. A biography of Major General Earl Partridge the commander of the American 5th Air Force in Korea.. . . The defence of the Naktong River by the American 24th Division which is attacked by the North Korean 4th Division. The North Koreans seize Cloverleaf Hill and the Obong ridge. Early American attempts to retake the hill are unsuccessful, but with the help of the Marine, they finally regain them. A biography of Major General Lee, commander of the North Korean 4th Division.. . . The counterattack by the American 25th Division west of Masan. The battle of the Bloody Gulch. The murder of American prisoners of war by the North Koreans. The American 25th Division withdraws back to its start line. A biography of Major General Keen the commander of the American 25th Division.. . . The balance of power begins to swing against the North Koreans. A description of the terrain along the Pusan Perimeter. The heat and lack of water in August 1950. The disposition of the American, South Korean and North Korean Divisions along the Pusan perimeter. The M26 Tank now arrives in large numbers to aid the American Army. A biography of Major General Gay the commander of the American 1st Cavalry Division.. . .
American Air supremacy. The poor nature of Korean roads. The importance of the port of Pusan. The logistical command of the Eight Army. The control of the seas off Korea by the naval forces of the United Nations. A biography of Admiral Joy the commander of the United Nations naval forces.. . . The American defeat at the Chinju. The American counter attack towards the Chinju pass. The American defeat of the North Korean 6th Division at Chindong. A biography of Colonel Michaelis the commander of the American 27th Infantry Regiment.. . . The successful defence by the South Korean Second Corp is undermined by the defeat of the South Korean First Corp at the battle of Andong. The fight for the town of Yongdok near the east coast. The plight of Korean refugees. A biography of Kim Paek Il, the commander of the South Korean First Corp.. . . The arrival of the American 25th Division and the American 1st Cavalry Division into the battle, however they are pushed back by the North Korean Army. The poor performance of the American 24th Regiment. General Walker's 'Stand or Die' order. A biography of Leon Gilbert an American officer sentenced to death by a Court Martial.. . . The North Korean Army conquest of South West Korea. The defeat of the American 24th Division by the North Korean 4th and 6th Divisions. American Air Force tactics as the North Korean Army learn not to expose themselves during the day. A biography of Brigadier General Church, the new commander of the American 24th Division.. . . The American press reaction to the American Army's defeats in July 1950. The defeat of the American 24th Division by the North Korean 3rd and 4th Division at Taejon. Major General Dean is captured by the North Koreans. A biography of Marguerite Higgins, an award winning war reporter.. . . The American defence of the south bank of the Kum River is broken though by the North Korean Army. The planning of future reinforcements for the United Nations Army in Korea. The poor state of some American equipment in Korea. The improved ground attack performance of the American Air Force. The F51 Mustang warplane. A biography of General Walker the commander of the Eight Army.. . . The South Korean Army fights to delay the North Korean Second Corp in Central and Eastern Korea. The diet of the South Korean Soldiers. The mass murder of South Korean Civilians by the Army and Police by both the North and South Korea.. . . The piecemeal deployment of the 24th Division. The American defeat at Pyeongtaek and Chonan. The American retreat to the Kum River. A comparison of the North Korean T34 tank and the American M24 light tank. The biography of the Division commander Major General Dean.. . . The bad state of the South Korean Army south of the Han River. The North Korean Army crosses the river and strikes South. The American Air Force in action. The first American ground troops go into action. A biography of General Stratemeyer commander of the American Air Force in the far east.. . . The United Nations votes to use force to defend South Korea. President Truman commits American military forces to South Korea. The United States Air force in action over South Korea. General Mac Arthur visits South Korea. A biography of Harry Truman.. . . The South Korean Government to defend Seoul. The premature destruction of the bridges over the Ham River trapping part of the South Korean Army on the North Bank. The North Koreans captured Seoul. A biography of Kim Chaek, the deputy leader of North Korea.. . . The attack of the North Korean Second Corp in central and eastern Korea. The reaction of the American Government to the North Korean invasion. The United Nations Security Council meets to discuss the invasion. A biography of John Chang the South Korean ambassador to the United States.. . . The attack of the North Korean First Corp. The capture of the Onegin peninsular. The advance towards Seoul. The reaction of the South Korean Army Command, the failure of their counter attack at Uijongbu. A biography of General Chae, the Chief of Staff of the South Korean Army.. . .
Russian involvement in the invasion planning. The superiority of the North Korean Armed Forces. The failure of the South Korean Army high command to realise the signs of the coming invasion. A biography of Kang Kon, the North Korean Army chief of staff.. . . The South Korean Government and Army from 1948 to 1950. The withdraw of American and Soviet troops from Korea. The border battles between North and South Korean troops. The international background of the Cold War. A biography of Pak Hon Yong, the South Korean Communist leader.. . . The American occupation of South Korea from 1945 to 1948. The troublesome nature of politics in South Korea. The difficult working relationship between the Americans and the Soviets. The formation of the South Korean Constabulary. A biography of General Douglas Mac Arthur, the commander of American forces in the Far East.. . .
A History of the Korean Communist Party. The Soviet occuaption of North Korea. The Communist takeover of North Korea. The creation of the North Korean State. The foundation of the North Korean Army. A biography of Kim Il Sung.. . . The geography of Korea. The History of the Japanese occupation of Korea. A biography of Syngham Rhee, the first president of Korea.. . .